Premolded plastic termination strips are used in conjunction with hand troweled or self-leveling resinous flooring systems. The PTS strips are adhered horizontally to the wall surface to form a controlled edge for the placement of the formed cove or glued to horizontal substrates for controlled termination of the flooring systems. 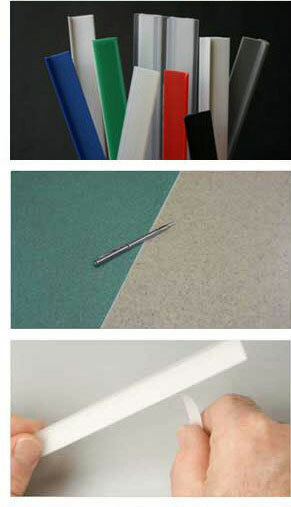 COMPONENTS: All of the PTS strips are available in Clear and 6 standard colors - Gray, Red, Blue, White, Black and Green. Other colors are available upon request. PTS strips are manufactured in 5' lengths. Other shapes and configurations are available upon request. Contact us for sample board.